Earlier this week, we released a short film on the work being done by the Woodland Park Zoo’s Tree Kangaroo Conservation Program (TKCP) to conserve the cloud forest of Papua New Guinea and the elusive tree kangaroos that inhabit it. Take a deeper dive into the project in this first-hand account with Woodland Park Zoo President and CEO, Alejandro Grajal, PhD. 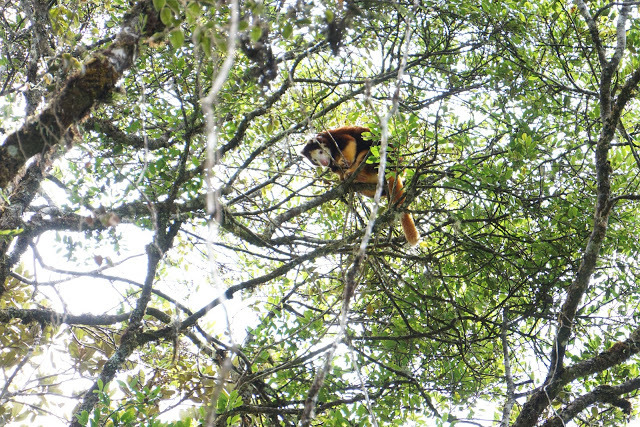 A tree kangaroo checks out the hikers. Photo by Alejandro Grajal/Woodland Park Zoo. 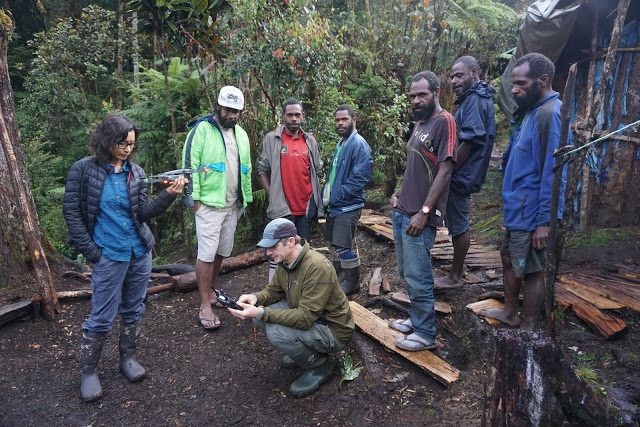 Grajal recently took a trip to Papua New Guinea, where he explored the community and conservation impacts of TKCP. His mission? Experience first-hand the TKCP community and landscape that coexist in remarkable ways, bring back some of their stories and change the batteries on three radio collars attached to three tree kangaroos that live nearly three stories about the forest floor. The following is an excerpt of an interview between Alejandro and Woodland Park Zoo’s Kirsten Pisto about what he experienced through this community-based model of conservation stewardship and why he’s so optimistic about its success. Dr. Lisa Dabek (top row, second from right) with the tree kangaroo radio collar team. Photo by Alejandro Grajal/Woodland Park Zoo. KP: You recently returned from Papua New Guinea’s remote YUS Conservation Area. Tell us about the region, what surprised you about your visit? AG: It was a fantastic trip. I have been to many different places, but this was very interesting, very unusual. The thing that surprised me most about the visit was, first, the region where we were is incredibly well conserved. I saw nearly pristine primary cloud forests — the kind that are very hard to find anywhere in the world. Second, how generous and proud the people of the YUS ecosystem are about their conservation ethic and their conservation planning. The work they are doing to figure out the balance between conservation and economic progress and health—it’s a struggle just like for anybody—but they were very optimistic. That was very refreshing to me. I have seen a significant number of conservation projects. I have to say when you compare how much the community has been involved and look at the amount of biodiversity that is being preserved—it’s very remarkable. The fact that Woodland Park Zoo has nurtured this program makes me very proud. KP: You traveled with Director of the Tree Kangaroo Conservation Program Lisa Dabek, journalist Penny LeGate and nature filmmaker Joe Pontecorvo. What insights or new perspectives were you able to experience with these travel companions? AG: Going with Lisa was an eye-opener. 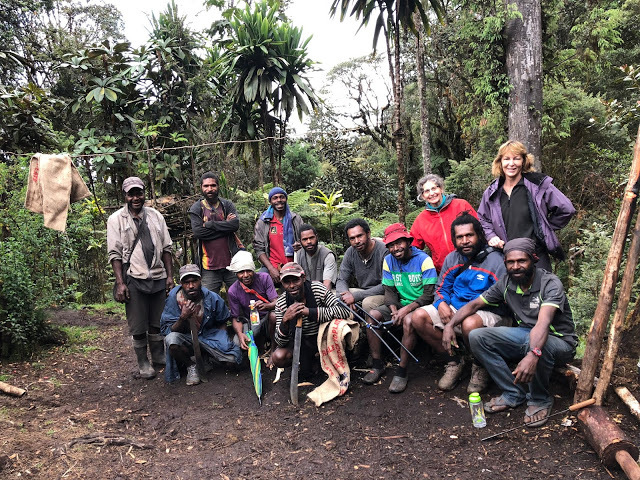 I have known Lisa from the Seattle-perspective, but seeing her on the ground—the endless energy that she puts into everything, and the admiration and comradery that she gets from her counterparts in PNG was a true joy to see. She is no question an amazing leader; she has built trust, friendship and confidence around her and that is beautiful. Traveling with Penny and Joe, and Joe’s wife Nimmida, was also an interesting look at storytelling. Joe is a seeker of images, very skilled, very detail-oriented. Penny has a unique talent to find the human stories in this larger context. The way she connects with people and is able to distill these human stories out of this complex project is exciting. Their perspectives are very valuable and bringing this type of multimedia storytelling back to Seattle is key. This will allow us to invite others to join our journey—not only in PNG, but around the world. Joe and Nimmida Pontecorvo prepare drones for a different camera angle. Photo by Alejandro Grajal/Woodland Park Zoo. KP: The Tree Kangaroo Conservation Program is a benchmark model for conservation not only in protecting wild places and wildlife but in creating a community of conservation-minded partners. The success of this program is clearly linked to the people. You’ve mentioned the human story; can you speak more to that? AG: In the end, what we are trying to do as a center for empathy here at the zoo, is not very different than what Penny was trying to do in PNG as a producer. Both are trying to convey the different perspectives of the struggles and individual stories of a person or animal. These stories can be framed in a way that relates to personal emotions. Narration is important. I hope that these stories we brought will produce in the viewer a feeling of true empathy for the people who are truly acting as conservation heroes. If others see that folks around the world are making these lifestyle changes that benefit the environment, then these changes feel more accessible. KP: Tree kangaroos are naturally elusive and live in the highest treetops. Were you lucky enough to see one? AG: Oh yeah! We got super lucky. The main objective of the trip was to change the radio collars on these three animals because the batteries were dying. Luckily, we are getting new high-tech GPS enabled radios that will arrive in October. So, this was a temporary fix, because once you lose the battery, you lose the animal, so changing the collars was very important. Not only did we catch three of them, but we also discovered a young tree kangaroo with one of the collared adults, which we also collared. I had heard about tree kangaroos, and have seen them in zoos of course, but to see them in their natural environment with this kind of magnificent forest of mosses, ferns and orchids—the silence when you get into these primary forests, wow. The thing that you notice is that all the sounds come from this forest and otherwise there are no sounds from the outside. It’s almost poetic to see these animals in their own ecosystem. It’s one of those inspiring moments you live to live. The local team we worked with was unbelievable. How they moved through the forest, the way they climbed the trees, and how incredibly attuned to the forest they were. It’s nearly impossible to see these animals in the wild. They sleep on branches 28 feet above the forest floor on mossy clumps that are nearly the exact same color as the animal. The moss is bright orange, and unless the animal moves an ear or tail, there is no way you are going to spot it. We had to isolate the animal, so we were supported by Dr. Carol Esson, an Australian wildlife veterinarian, who has worked with the project several times. She made sure that the animals were safe and not harmed during the process. They are so incredibly fluffy, but also very, very wild. As usual, with wild animals, I am just in awe of their presence. 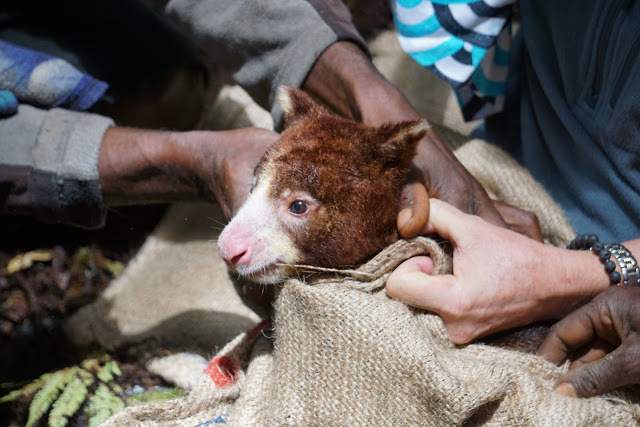 A wild tree kangaroo is caught, her radio collar batteries are replaced, and then she is released back into the tree tops. Photo by Alejandro Grajal/Woodland Park Zoo. KP: What do you see as the next iteration of this project? Camera traps, data collection, technologies are always improving. What is the zoo’s role in helping Lisa and TKCP move forward? AG: This is the first protected area in PNG, and it has also become an emblematic program for all protected areas in the country. Many organizations have tried and failed to accomplish this. This project is a living laboratory on how to conserve whole ecosystems and work with the local communities to achieve conservation results. That is huge. Yes, there are great improvements in tech and tracking, and we’ve recently come light-years ahead in understanding the connection between healthy forests and healthy people, but the bigger thing is truly saving these ecosystems. Preservation is key. The vast majority of the country is in nearly pristine condition. Providing solutions between conservation and economic growth is truly important. How do we develop economic opportunities and save these magnificent landscapes? How do we use the YUS Conservation Area as a model to do the same in other parts of PNG? That is the future. Read the full interview over on the Woodland Park Zoo Blog, and be sure to watch our short film, A Life Among the Clouds to learn more about tree kangaroos and this important work being done.